Lesson Plan - The Stories 'me'y'mi'y'm - "telling the stories"
Introduction and Objectives: the What and the How. Learning Activity A: Demonstration and Listening. Learning Activity B: Sqigwts 3-D Landscape and Being Attentive. Learning Activity C: Demonstration and Re-Telling. Learning Activity D: Reflection and Assessment. 1. Introduction and Objectives: the What and the How. The primary goal of this lesson plan is it to have your students gain an appreciation and understand of the hnkhwelkhwlnet “our ways of life in the world” and miyp, “teachings from all things” associated with sqigwts (water potato, Sagittaria latifolia) of the Schitsu’umsh (Coeur d’Alene) of Idaho. It seeks to provide a Schitsu’umsh (Indigenous) perspective to this understanding. And with this understanding, students will be to apply this knowledge to other situations, such as to social and economic practices related to global climate change. As there is an unequivocal relationship between the content of a curriculum, the What, and the pedagogical ways of accessing and delivering that content, the How, the following lesson plan is cognizant of the importance of this alignment. Understanding hnkhwelkhwlnet and miyp are the “What” of the curriculum. One of the best and most appropriate means to have students learn about the cultural traditions of a Tribe, as for example, to learn about the hnkhwelkhwlnet of the Schitsu’umsh, is through the oral narrative traditions of that community, through the stories of Coyote and the other Animal Peoples, through ‘me‘y‘mi‘y’m “telling the stories.” The act of storytelling cultivates skills in listening, speaking, participatory learning, and empathy. This pedagogy, ‘me‘y‘mi‘y’m, addresses the “How” of the curriculum. To approach hnkhwelkhwlnet from a traditional Euro-America educational method, for example, would only result in misrepresentation and distortion of Schitsu’umsh knowledge and practices. 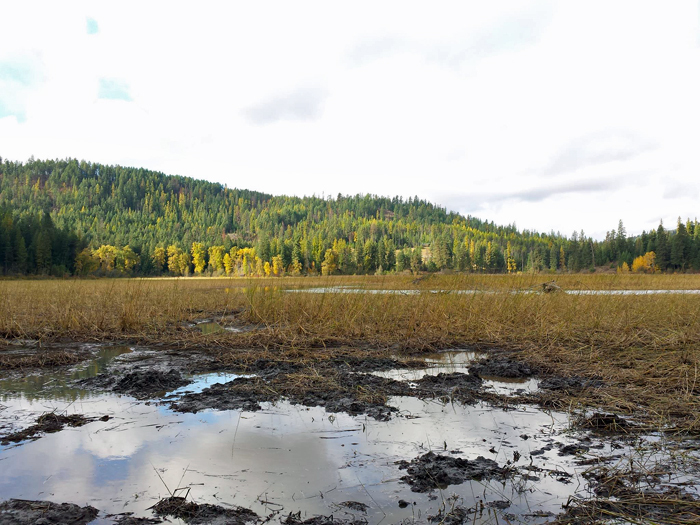 This curriculum is designed to be used by the Coeur d’Alene Tribe, the Northwest Climate Science Center, and colleges and universities throughout the country. The appropriate grade levels are intended for seniors in high school, and first/second year students in college. This lesson plan can be used to address the Idaho State Content Standards: Interdisciplinary Humanities, Grades 9-12. There is no prerequisite knowledge necessary to fully engage this curriculum, other than general mastery of age-appropriate skills in reading, writing, math, and critical and creative thinking. There will be four Learning Activities (A-D) presented in this lesson plan. Each activity could be used separately or in any combination with each other. The teacher of this curriculum is encouraged to utilize any and all activities and resources, modifying those materials to meet the needs of his or her students. For each Learning Activity, it is essential that students gain an understanding of the historical and cultural context within which the oral narrative traditions emanate. An appreciation of these contexts is critical for a student’s ability to understand and apply the teachings of the Schitsu’umsh hnkhwelkhwlnet. In addition to resources included as part of this module, there are additional resources listed below that can be consulted to help provide these historical and cultural contexts. hnkhwelkhwlnet “our ways of life in the world” – the Schitsu’umsh Indigenous cultural knowledge and practices associated with sqigwts “water potato”. stmi’sm “listening” – skills in listening and being attentive. 'itsk'u'lm “doing” – skills in active participatory and experiential learning. snukwnkhwtskhwts’mi’ls “fellow sufferer” – skills in empathy. hnkhwelkhwlnet: phenomena has existence as the transitory intersection of those participating (human, animal, plant, water, spirit), anchored to place-based (specific landscape) oral traditions (language, narrative, song, dance, regalia, kinship behavior, sqigwts gathering method, etc. ), which are embedded with the miyp, that are passed down orally from generation to generation, since time immemorial. Or rephrased, it is an event made real by those participating, their relationships with each other guided and rendered meaningful by the oral traditions of a specific landscape. For further discussion, see Schitsu’umsh and Frey 2001 and to prepare students to better appreciate and understand hnkhwelkhwlnet, consider discussing the story of the “rainbow” in the hnkhwelkhwlnet and TK/TEK unit in this Sqigwts 3-D Landscape module. ephemeral event (not reducible to a state as a material object, and cannot be rendered discrete, disconnected isolates). embedded thought with action, knowledge with participation (“mind” and “body” not distinct; no Cartesian Dualism). experientially brought forth (only has existence when participated). convergence of the collective participants (collective knowledge; not individually generated), with those participating including human, animal, plant, rock and water (all of whom are in relationship equality with one another). no hierarchical relationships, (one participant dominating over another). those participating include Spiritual Beings (the Creator and Animal/First Peoples). place-based (meaningful only in its landscape of origin). miyp-based (“teachings from all things” from time immemorial). orality-based communication and dissemination from generation to generation. miyp: From an Indigenous perspective, the teachings are inclusive of the grand “perennial archetypes,” moral and ethical codes, practical utilitarian skills relating to religious, social and ecological roles and responsibilities, and aesthetic and spiritual sensibilities, as expressed in the Schitsu’umsh term miyp, “teaching from all things.” They are necessary for humans to thrive and prosper. Teachings are understood as “gifts” embedded in the world by the Creator and the Animal/First Peoples, to be revealed and discovered by humans by being “attentive, listening” to the landscape and the oral traditions. uchnek’we’ - “we are all relatives/we are all one,” or as sometimes referred to as chnisteemilgwes - “I am your relative,” part of all peoples – human, plant, animal, fish peoples. unshat‘qn – “we’re all equal height at the head; eye-to-eye.” We are all equal to one another, human, plant, animal, fish peoples. . . . None are better than another. snukwnkhwtskhwts’mi’ls – meaning “fellow sufferer,” or what you might call, “empathy.” We try to care for the needs of our future generations, those yet to be born. We try to care for those in need, those who need our help today. Related terms are, spute’m – “respect” to be shown to others, and spi’pe’t – “generosity” to be shown to all our relatives. snqhepi’wes - “where the spirit lives, from horizon to horizon.” This is the acknowledgement of meaning and power of the spiritual embedded in all phenomena, and in all activities, human, plant, animal, fish, rock and water. snukwnkhwtskhwts’mi’ls ł stsee’nidmsh – snukwnkhwtskhwts’mi’ls literally meaning “fellow sufferer,” or what is called “empathy,” and stsee’nidmsh “adaptive” – hence the phrase, “empathetic adaptability.” This is a competency that facilitates understanding the perspectives and positions of others, which in turn, can allow one the ability to more effectively walk the walk of others and engage in multiple ways of thinking and doing. Consider that the phrase, hnkhwelkhwlnet entails “our ways of life in the world.” In the act of ‘me‘y‘mi‘y’m, this is when the storyteller adds the “heart beat and muscle” to the “bones,” giving dynamics and life to the story and welcoming the many diverse participants to engage within it. In the context of any sort of challenge, be it internal or external to a community or an individual, this is a capacity to think outside the box and be innovative and creative; this is the capacity to adapt to changing circumstances and conditions; this is the capacity to retain one’s “bones,” one’s core teachings and values, while exerting a flexibility in “muscles” of one’s arms and legs to lift new loads or walk new paths. Related to climate scientists, this is the capacity to understand “perfect strangers,” and acquire a level of competency to begin to approximate the thinking and acting of that stranger, i.e. for a scientist to better understand, communicate and collaborate Indigenously, acknowledging and appreciating Indigenous ways of knowing and doing as complementary to scientific ways of knowing and doing. For further discussion on these two key terms, see Schitsu’umsh and Frey 2001 or the various units within this module. 4. Learning Activity A: Demonstration and Listening. For a printable copy of the Learning Activity - Stories.pdf. The most insightful and rewarding way to have students access and learn about the oral narrative traditions is by having them listen “attentively” to the stories as re-told by a Tribal elder. When possible, have a variety of Tribal elders and experts come to your class and present on a range of pertinent topics. Most rewarding is having elders share in their favorite narrative story, stories of Coyote and the other Animal Peoples, and of the creation of the world. In doing so, elders wonderfully demonstrate the power of storytelling, modeling it for the students. Don’t forget to gift those who have shared – a meal after the class presentation, a little gas money. It is common and appropriate practice to give an honorarium. We acknowledge that given your school’s particular location, you may not have access to Tribal storyteller elders. As a secondary substitute, consider accessing some of the resources listed after Learning Activity C, below. 5. Learning Activity B: Sqigwts 3-D Landscape and Being Attentive. For a printable copy of the Learning Activity - Stories.pdf. Developed specifically for this curriculum is a learning exercise that engages students as if they were gathering sqigwts under the guidance of an elder. Presented as an unfolding story, the “Sqigwts: Interactive 3-D Landscape” replicates for students the experience of participating in the gathering, and calls on students to be attentive and make the proper choices at key junctures in the storyline. This module provides invaluable supplemental and background information on hnkhwelkhwlnet, as well as on the means of accessing it through the act of storytelling. The experience of having to experientially navigate the 3-D Landscape will itself offer insights into hnkhwelkhwlnet, as well as the important skills of listening and participating with empathy, all in alignment with Indigenous teaching practices and learning styles. 6. Learning Activity C: Demonstration and Re-Telling. For a printable copy of the Learning Activity - Stories.pdf. To further promote listening and speaking skills, this learning exercise has the students themselves re-member and re-tell “authentic” stories. In the act of re-telling the cherished stories, students can get an experiential insider’s view of the story’s landscape, and gain a heightened appreciation, as well as opportunity to have revealed to you something special in the story. Have the re-telling done in small groups of fellow students. In this small venue, perhaps more intimate for the student, the storyteller may feel less intimidated. The story is only fully engaged and brought to life when shared “live,” in performance with fellow student participants. It then becomes the responsibility of the student storyteller, using his or her particular repertoire of storytelling techniques and energy, to reanimate the bones of the story with “flesh,” to bring the story “alive” for the audience, now hopefully transformed into participants within the unfolding story. It becomes the responsibility of the student listeners to actively listen and participate in the story. The storyteller helps develop his or her speaking skills, while the story participants develop skills in listening. And if the story is truly brought to life, the storyteller and story participants have to some degree demonstrate their abilities empathize with each other and with the characters of the story, to appreciate the experiences and perspectives of someone else. See ‘me‘y‘mi‘y’m "telling stories" #4a in this 3-D Landscape module. It is interesting to note that the very same story might be animated by one student raconteur with extensive use of dynamic intonation and differing voice inflection for each character, while another storyteller might apply visual body language and hand gesturing to help bring the same narrative alive. In each case, experiencing the stories from the inside looking out can bring a whole new awareness of their meanings. And it is an experience students will not soon forget. While the experience can be met with anxiety by some students, in having to publicly re-tell a story in front of fellow students, the resulting benefits are always eventually appreciated by the students and the instructor. 7. Sources and Resources. When selecting a story have your students select from among those narrative collections that can be appropriately and publicly shared by a Tribe (Aripa, Yellowtail and Frey 1995:232-40). Some stories are held by a family for their use only, and are not meant to be shared with the general public. Ask first. Ideally, it is best to obtain a story from a local Tribal elder. But if such access in not possible, consider existing published sources. Check on how a collection was obtained from Tribal members; was it done in collaboration and with a Tribal review and approval process? You can have your students listen and see Schitsu’umsh elders share stories via video streaming by accessing the “Schitsu’umsh Lifelong Living Online” web site (2002). While accessing some great Schitsu’umsh stories, this is a great source for students to see and hear differing styles and techniques of storytelling demonstrated. There is also a guide for snchitsu’umshtsn pronunciation, and historic and cultural background discussion on the stories. Students can also access a variety of sources with written narratives. Attempt to have students’ access narratives that have been recorded in their native language, with an English interlinear transcription, along with a free translation. In so doing, elements of the storytelling nuance, such as deictics, phrase repetitions, quotative suffixes, verb tense forms and personal pronoun usage, so often removed or rendered into standardized English upon editing a story for publication for a wider audience, can be better identified and reintegrated into the re-telling. With these texts, students can also more readily access what are called the “bones” of the story. We have the original typed notes of Gladys Reichard, who in 1927 and 1929, worked with two elders, Dorothy Nicodemus (over 70 years old at the time) and Tom Miyal, who provided this wonderful collection of "Coeur d'Alene Texts," (University of Indiana, Archives of Languages of the World 1946). These texts are written in snchitsu’umshtsn, with English interlinear transcription. Included in this collection is the account of Schitsu’umsh culture hero, Chief Child of the Yellow Root. A free translation of these stories is found in Reichard’s An Analysis of Coeur d’Alene Indian Myths (American Folklore Society 1947). Also access the Coeur d’Alene Tribe’s Online Language Resource Center “COLRC”, which includes extensive language and story resources, and Ivy Doak’s “Reichard’s Coeur d’Alene Texts”. Also consider collections of more contemporary printed story re-tellings, in Stories That Make the World: Oral Literature of the Indian Peoples of the Inland Northwest as Told by Lawrence Aripa, Tom Yellowtail and other Elders. (Aripa, Yellowtail, Frey. University of Oklahoma Press 1995) and in Landscape Traveled by Coyote and Crane: The World of the Schitsu'umsh - Coeur d'Alene Indians. (Schitsu’umsh and Frey. University of Washington Press 2001). In seeking out a narrative for re-telling, have students select a story that somehow “speaks” to them, for which they have found some sort of affinity and attraction, be it a lesson or character engrained in the narrative. With these sorts of texts, students can also more readily access what are called the “bones” of the story. As the stories are understood by the elders as a “living being,” a “person,” with the bones as the essential storyline and, most critically, the miyp “teachings” embedded within. In the re-telling, it is critical that the student retains all the bones, not adding new ones, not forgetting the perennial ones. 8. Learning Activity D: Reflection and Assessment. For a printable copy of the Learning Activity - Stories.pdf. Following the Sqigwts 3-D Landscape engagement and the student story re-telling experience, have students reflect on what may have been revealed to them and they discovered within the story, on their “ah ha moments”. This "revealing" and "discovery" process is best approached and appreciated from a Schitsu'umsh perspective. The English term "discovery," for example, is loaded with many meanings, some of which may mislead and distort that which we seek. What have been the implications of Columbus "discovering" the American Indian? There are two snchitsu'umshtsn terms that better convey the meaning and significance of the "ah ha moment." The first term is chetche'in'nts, "to reveal, disclose, or uncover," implying that something that had been hidden, something that had always been there, is now revealed. And the other term is hischits “it is my discovery," as if unintentional, as if almost by accident, referring to the great effort one must assert by being attentive and listening, all the while not knowing what might result, what might be revealed. And then comes the "ah ha," and you have, through your great efforts, discovered one of the "bones," uniquely appropriate given your particular background and life experiences, "it is my discovery." It is not a "my" in the sense of ownership (aka Columbus), but a "my" in the sense of linking you in particular to the "bones," while acknowledging access to what countless others before you had gained access to. Remembering that elders typically don’t offer an Aesop-like ending, “and this is what the story means,” as there are no “correct or incorrect” insights made by students about the meaning or moral of the story. Encourage and support your students’ many possible interpretations, within bounds. Help the student place a revealed miyp within the cultural background of the Schitsu’umsh. Help the student see these miyp in the context of hnkhwelkhwlnet knowledge, practice and teachings. Keep in mind that in the storytelling tradition, the story’s meaning is always relative to the level of experiences of the listener participant. The meaning derived from a high school student’s first experience with sqigwts will inevitably change from that student, as they re-engage the same sqigwts experience as a sophomore in college. The meaning derived from a Native student’s experience with sqigwts will inevitably differ from that of a non-Native student’s experience. This makes assessment of a student’s gained level of competency challenging. It is important to have the student fully articulate what he or she learned, and have him or her reflect on the implications of that knowledge. Did the student fully articulate in spoken or written word, his or her new knowledge? To reflect is not to simply summarize (as important as that is), but to seriously contemplate and consider the cultural context, meanings, assumptions and implications of what was learned. For example, a student might have been impressed with the miyp - unshat’qn “eye to eye,” the notion that the animals and plants are to be viewed and engaged as equal to humans. How might that effect how that student engages the plant and animal world around him or her? Assessment here would be based on your student’s ability to articulate any revealed miyp or other culturally related insights. While there are no “correct or incorrect” answers, the level of a student’s engagement in the stories can and should also be assessed. Assessed standards would be based on the level of a student’s attentiveness, listening and participatory skills. “We learn by listening, stmi’sm. We learn by doing, ‘itsk’u’lm." Assessment standards would be based on the student’s level of demonstrated empathy. Did the storyteller effectively understand his or her audience, and able to modify the “flesh” of the story to draw them into the story? Did the story participants effectively understand the Animal characters met within the story? What is the cultural context within which the oral narrative traditions emanate? How were the stories of the sqigwts and the narrative selected for re-telling similar and different? Were there any shared miyp common to both? In the acts of engaging both, were there any structural and dynamic similarities? Who were the Animal or First Peoples witnessed in both stories, and what did they bring about or do? What are the fundamental miyp, “teachings” and "cultural themes" embedded in the oral narrative traditions and what are their defining qualities? Or re-phrased, what "teachings" are revealed, conveyed, discovered and learned in the stories? Contrast orality and oral communications with literacy and written communications. What are the implications of orality and of literacy on how oral narrative traditions are understood and conveyed? What are the specific techniques of telling used by storytellers in their re-telling of the stories? In considering the techniques often used by storytellers, and the dynamics of orality, how do these processes coalesce and influence the role of the "listener" of a story? In other words, what are the primary intentions of a storyteller with regard to his or her audience? What are the purposes of the oral traditions? Or rephrased, why do elders continue to re-tell their stories? What is the relationship of these oral traditions with the culture and society from which they emanate? What are some of the insights uniquely offered in an appreciation and understanding of hnkhwelkhwlnet and Indigenous knowledge? Compare what is uniquely offered in hnkhwelkhwlnet when compared with scientific and other ways of knowing. In an appreciation of hnkhwelkhwlnet, what possible miyp were revealed and learned that might help address policies and practices related to addressing global climate change? How might a Schitsu’umsh elder view global climate change, and seek to address it? 9. State of Idaho High School Content Standards: Interdisciplinary Humanities, Grades 9-12. The two of the three Idaho Content Standards for the Humanities: Interdisciplinary, Grades 9-12, are suggested for consideration and use in the ‘me‘y‘mi‘y’m lesson plan. For a printable copy the Idaho State Content Standards - Stories.pdf. 10. The Rewards. It is rewarding to have students, first fully engage in the stories, bringing them to life as part of this assignment, then to have those same students re-tell the stories, fully animated, with all the “bones,” before a another group of local elementary or high school students. What a wonderful way to extend the life of these stories and render them accessible to many others. 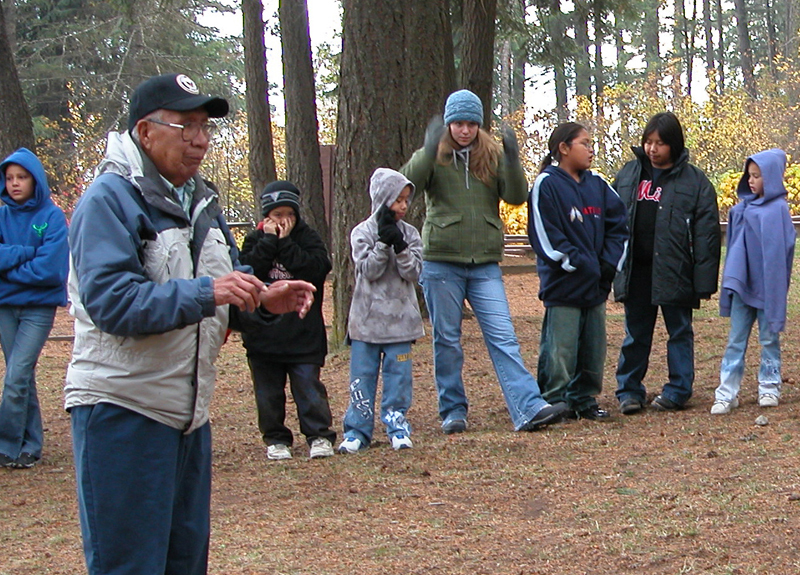 We first glimpsed the excitement and approval of Tribal elders in having non-Indian students re-tell their most cherished traditions when a fourth-grade teacher in the Coeur d’Alene School District had his students publicly “perform” Schitsu’umsh oral narrative traditions. Using stories recently approved by the Schitsu’umsh for public sharing and developed for use in the 1992 school districts language arts curriculum, the students, with their youthful energy, brought the stories to life. With both Tribal elders attending the performance, they had nothing but delight on their faces and positive comments to say about the performances and use of their stories in this fashion. While these two wonderful storytellers have passed on, we can still continue re-telling their stories, as imprinted in many of the resources listed in this lesson plan. The stories continue to allow us to explore, revealing their secrets to us.